But it can't be from Dolly Clackett. She gave me an Easter egg! : Your legend appears violent and unpleasant. And rather too convenient! Your legend appears violent and unpleasant. And rather too convenient! I've been planning out this blog post in my head for a few days now, but now that I've sat down to actually write the dratted thing, my mind has gone curiously blank. It's been a week for that kind of thing, though. This month is going by far faster than I could have credited when I dragged myself out of bed and onto the 7:18 to London on 4th January. Experience tells me it's usually February that I find difficult though so I won't wish this month away just yet! I'm now into the third week of my new job. So far it's going well but I'm still being eased in, I think. There are a number of IT issues that are being slowly resolved (I need a new laptop and a Blackberry, apparently) and it was only on Tuesday that I was actually granted access to the floor our team work on! It's a secure floor so I needed extra security clearance. This was a real pain because the toilets are on the stairwells, so I needed someone to let me in and out every time I needed to pee! The job itself is shaping up to be very interesting and I'm glad I made the move. When the work really kicks in it's going to be very busy, but I don't mind that at all. The only (very minor) gripe I have at the moment is that, while the train journey down to London is fine, the train journey home feels like it takes forever. This is made worse by the fact that I'm usually too tired to really enjoy reading. I think I might start bringing some knitting or crochet with me. Writing isn't really an option because I just can't get on with the little tables they have on the train - the pull out bit has an uncomfortable ridge and I can't rest my elbows enough so that writing isn't really tiring on my arms. Oh whinge whinge whinge! The good things are that it's miles better than going into the office in Birmingham (which I hate) and it's round the corner from the Fever shop, and the job is good and I like the people. There, enough about work now! You can also see the beautiful Firetrap shoes my brother bought me for Christmas. Aren't they lovely?! I never would have thought of Firetrap shoes, but he obviously has a good idea of what I like! I had seen them last week but decided I didn't need them, but when we were in yesterday we thought it was a shame to leave them there so they came home with us. They're practically brand new as well, and considering they retail at around £25 I think I got a good bargain! Nic had similar luck today when he found the new Peladon Tales box set in CEX. This only came out on Monday. As he had some DVDs he wanted to trade in he got it for £4! I'm very excited about watching the two Peladon stories. I've seen The Curse of Peladon once before, and thought it really enjoyable. It's loosely based on The Hound of the Baskervilles, features David Troughton and has an amazing scene in which the Doctor sings a lullaby to a scary monster. 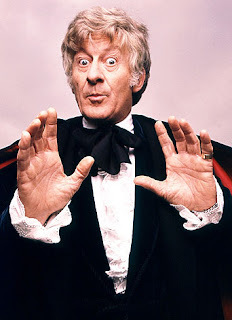 Caroline and I had a little conversation over Twitter about the relative merits of new Who versus old Who and I recommended Jon Pertwee-era Who to her. She felt a little dubious about classic Doctor Who because of seeing some of the less good Sylvester McCoy episodes in the 80s, and I think that's fair (although, I have come to like McCoy quite a lot after watching some of the better serials like The Curse of Fenric and Battlefield) but, as a relative newcomer to Doctor Who I have enjoyed every one of the Jon Pertwee serials I've seen. It's a very different beast to the Doctor Who on our screens today, but it is lots of fun. 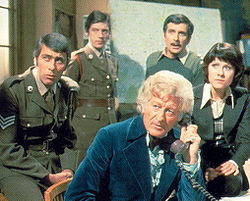 And look at Jon Pertwee's wee face, he's so cute! Enough Doctor-chat now, I think! The only other exciting shopping I did was to buy a pair of red tights from QS. As I have so many red dresses, these will go with lots of my clothes and I think they'll look good with some of the things I bought in the sales, like the Irregular Choice Flick Flack shoes and the Ruby Belle Sailor dress that I bought a while ago, but which it has been too cold to wear. I think I need to give my poor wee debit card a rest after all of that! 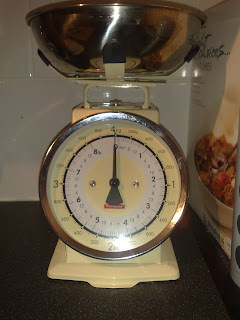 It's been a while since I included a list on my blog, but I'm going to end on one today.